Simply brilliant! This is the very latest great idea from Outwell – a range of collapsible essentials from crockery to colanders to a washing-up bowl and a brush containing soap – all using a sophisticated material that collapses completely flat when not in use. The full line-up here includes Collaps bowls in S, M and L sizes, and ideal for serving hot or cold portions of food. The Colander comes in two versions – on its own or with its own board; and the Dishwasher Brush makes the perfect accompaniment to the Washing Bowl. It all comes in quality siliconised rubber that makes it heat resistant and at the same time it is easy to clean and definitely will not collapse when carrying contents. 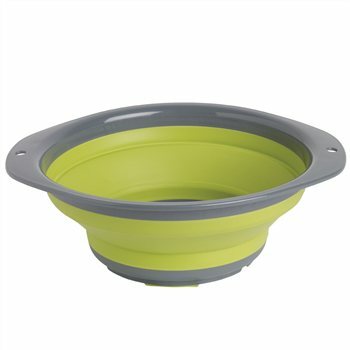 I bought these bowls as a gift for a camping buddie and was very pleased with the great service and product. Looking forward to giving them to her as I know she will love them! I bought this as a gift for a fellow camping friend and was very impressed with the quality of it. It seemed very sturdy for a collapible bowl and well made, as you would expect of Outwell. Good sized bowl for general use, mixing, salad etc, folds flat. Solid base and rim makes it stable to use. Ideal. Folds flat but holds an ample amount when open. Good purchase.